Written over a period of fifteen years, from 400 to 416, St Augustine's book 'On the Trinity' argued against heretics by attempting to show that the Bible contains the doctrine of God as three persons. Medieval theologians valued On the Trinity' because, besides defending the Trinity, Augustine compared the structure of human soul with it and explained how one could get a little understanding of Christian mysteries, or doctrine not completely comprehensible by living humans, by approaching them as riddles posed with symbols. The Benedictine monks of Rochester cathedral would have found a book on how to understand the mysteries very useful to their Bible studies. When this manuscript was copied, the Benedictines had relatively recently replaced the cathedral's secular chaplains, with the arrival of the Norman bishop, Gandulf, in 1077. Inscriptions on its first page state that it belongs in the cloister of Rochester Cathedral and that it was written in the same cloister by Humphrey, the precentor. On the final page of the manuscript are three pawn, pledge, or 'cautio', inscriptions: notes recording that the book was deposited in a locked chest in exchange for a loan. 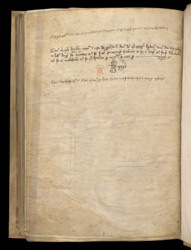 They reveal that John Kyrkeby deposited this manuscript, with three others, on 8 July 1468, for 30 shillings. On 11 February the following year he re-pledged it, with others, for 28 shillings.